Natalie Murphy, CPA joined Doug Child, Marty Van Wagoner, and their predecessor firms in 2001. Her expertise lies in the audit of SEC Registrants, complex debt and equity transactions, and business combinations, as well as the audit of government, not-for-profit, and privately-held entities in a variety of industries. 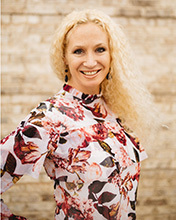 She obtained a BS in Accounting from the University of Utah and Weber State University, and a MPAcc in Accounting with Financial Audit Emphasis from Weber State University, where she was on the cheerleading squad and served as Vice President of Beta Alpha Psi, the International Honor Organization for Financial Information Students and Professionals. Natalie is a member of the American Institute of Certified Public Accountants (AICPA) and the Utah Association of Certified Public Accountants (UACPA), and enjoys recruiting firm personnel (on-campus and otherwise) and providing in-house CPE on various GAAP topics. Her outside hobbies and interests include participating in and watching numerous sports, running marathons, playing the piano, and spending time with family.